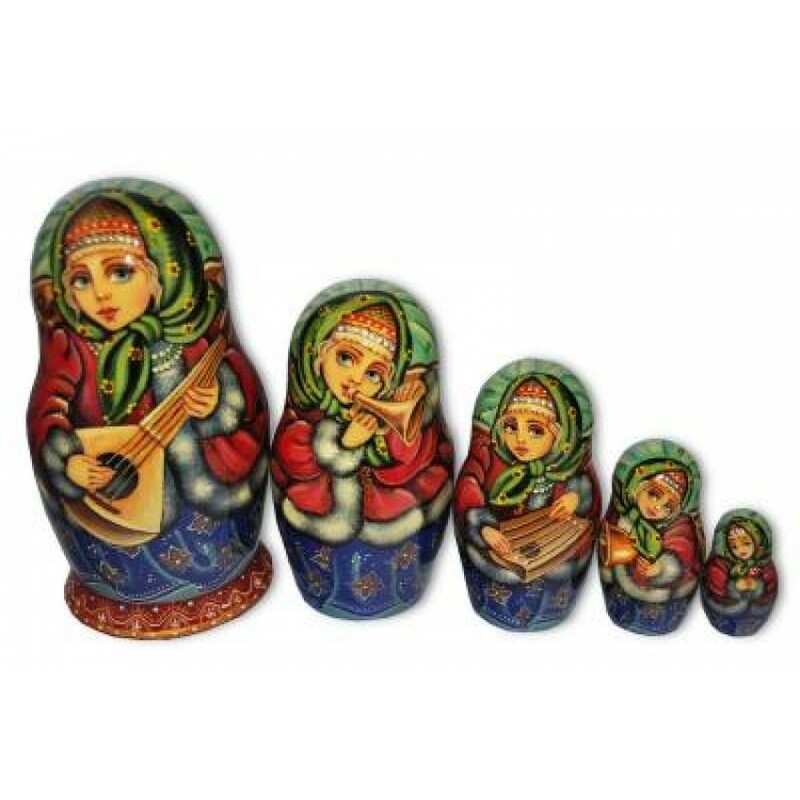 These Musicians Russian Matryoshka Nesting Dolls set is featuring Russian traditional musical instruments - Balalaika, Horn, Gùsli, and Bell. Due to Russian folk art. these instruments are well known today in the whole world. All these instruments are masterfully and in great details depicted on the Russian Matryoshka Nesting Dolls set. The first Russian Matryoshka Nesting Doll gets us acquainted with Balalaika, Russian folk guitar with triangular body shape. You can see slightly bowed back of Balalaika and four strings running from the tuning pins and being secured on the base of the instrument. The second Russian Matryoshka Nesting Doll shows us Horn. At first horns in Russia were used only while hunting, but gradually they began to be used as musical instruments because sounds of horn are really impressive and beautiful. On the third Russian Matryoshka Nesting Doll Gùsli is depicted. Gùsli is believed to be the oldest Russian multi-string plucked instrument, which was used by Skomorokh musicians. On the Babushka doll the girl carries on her knees the most traditional kind of Gùsli - helmet-shaped Gùsli. This instrument was spread in southern and western regions of Kievan Rus. Bell is shown on the fourth Russian Matryoshka Nesting Doll. Russians like bell because of its vibrant and melodious sound. Also it believed that its sound protects people from evil spirits. All the above mentioned instruments, drawn on the Russian Matryoshka Nesting Dolls have played an important role in the Russian music culture. But what makes these Babushka Dolls so peculiar is how virtuosic the artist Oksana Abaeva has painted lovely Matryoshka girls. They are dressed in traditional Russian clothes –coats with fur decorations, long sarafans, kokoshniks and fantastically ornamented kerchiefs. Their faces are magnificent – beautiful large eyes with long lashes look like real ones. This Russian Matryoshka Nesting Dolls set is considered to be authorial one. You can be sure in its uniqueness because it was designed and hand-painted exclusively for Russian Treasure store. We can promise you that you would not find the item alike anywhere else. The Russian Matryoshka Nesting Dolls set “Musicians” will become a true masterpiece in your Russian art collection and will decorate any place. Also, it makes a magnificent gift for those people, who like unordinary and exclusive presents. Impress your friends, relatives and beloved people with such a lovely Matryoshka set.